How can I find out what my order number is? Can I use a gift card and coupon together on the same order? I’m in a different country. Will my card be charged in my currency? Do you accept personal checks, cash, or money orders? 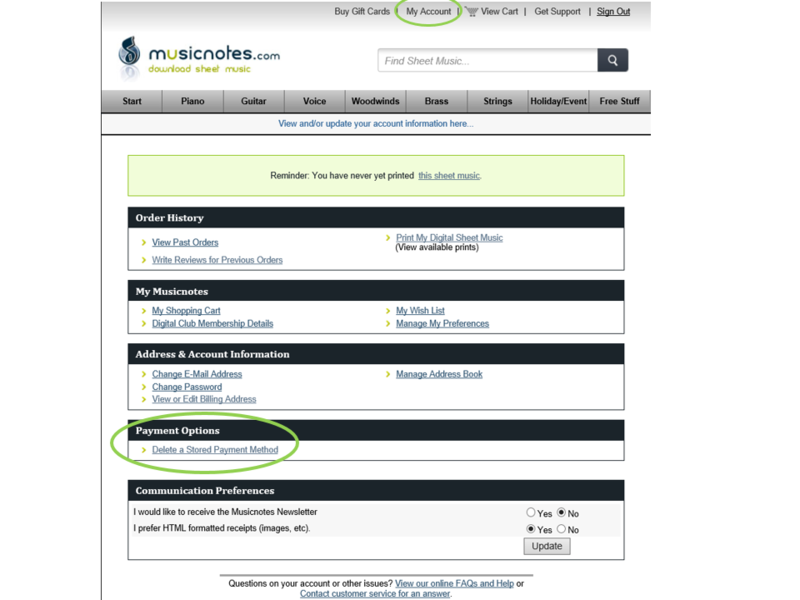 Is it safe to use my credit card on Musicnotes.com? What credit cards and payment methods do you accept? If you have any stored payment methods, you will see them listed here. Click on "Click to Delete" below any stored payment method, then confirm you would like to delete it on the next popup, and that card will be removed from our system and will not be listed as a stored payment method for future use on our site. At this time, the only way to store a payment method for future use on our site is to actually place an order and make sure there is a checkmark in the box next to "Save payment information for future purchases" on the page where you enter in your credit card or debit card information. The only way to edit a payment method for future use on our site is to delete and re-store the payment method with the updated information using the steps defined above. How do I change the email address, password or billing information on my account?